A Christmas flower delivery in Sydney of the utmost elegance and style. 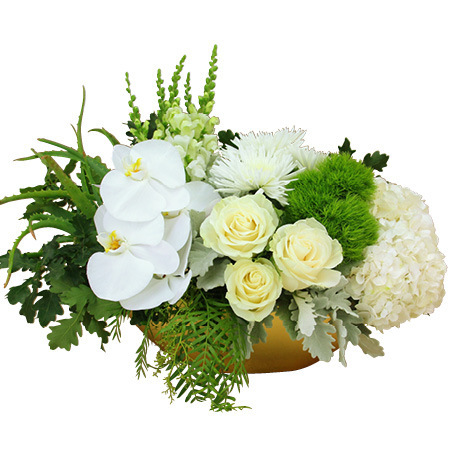 Our stylish design is arranged in a golden bowl and features a luxurious mix of all-white flowers including exquisite Phalaenopsis orchid flowers, summer hydrangea, fresh roses, fluffy chrysanthemums and creamy snapdragons. Accented with pops of silvery foliage and greenery such as aloe succulents and cascading pepper berry, this design is guaranteed to make an impression! Additional Information: Bowl is 11cm high x 22cm and finished flower arrangement approximately 20cm high x 32cm long. Deliver Christmas flowers in Sydney right up till Monday 24 December. The easiest gift ever! Order your beautiful flowers online now or call our team on 1800 66 66 46. Ps. These lux white flowers for Christmas go beautifully with a bottle of Moet & Chandon sparkling wine or a fragrant ECOYA home fragrance gift set from our range of quality gift add ons. Product : Stunning, very well received.